This hair has got to GO!!! It's ridiculous to have this much hair. I must have enough hair for 3 people. I know some people would die for thick hair, but it's a pain mostly. I really like the way it looks long when it's fixed. But I hardly ever do that anymore. It's always pulled back. It's hard to find clips and pony tails holders that fit around my hair. And it's in the way. Always tangled. So heavy. And so hot. I'm getting a good 3-4" cut off this week. It would have been gone sooner, but it took 3 weeks to get an appointment with my stylist!!! Mommy gets a day off! Today was a good day. I got dressed and left the house all alone about 9:30am and didn't come home until 4:00!! I saw "Spiderman 3" at the movie theatre. I liked it. I seriously considered hopping into the screen next door to catch "Shrek". There was a 45 minute wait for it to start though. And it was FREEZING cold. I didn't feel like freezing to death for another 3 hours, so I left. I went to the mall and bought clothes for ME! I'm sick of wearing this maternity crap. I got a few things to tide me over until (if) I lose this weight. I can't help but laugh though. I guess I'm showing my age.. but those long "bermuda shorts" that are so IN right now. We wore that in high school thanks to Jennifer Grey in "Dirty Dancing"! LOL! I walked around the mall a bit. At KB Toys, I found this bounce house thingy for Valerie. It's just the right size for her and was only $25, so I HAD to get it for her. She's gonna love it! Next I went to the dollar tree and then to Target. I was tired so I came home to an empty house. Clint took the girls down the bayou to visit some of his relatives. Even though the quiet is nice... I can't wait for them to get home. Until now, Valerie has handled not being the center of attention very well. The past few days have been hellish. All of a sudden, jealousy is everywhere. Often when I pick up Veronica, Valerie comes running needing something. Asking something. She's hungry. She needs a new diaper. She needs more lemonade. More milk. Or she'll ask, "momma, hold Valerie?" "sit momma's lap?" "lay down next momma?" "burp Valerie?" "my turn?" *sigh* And of course, her face crumbles when I say I can't or she has to wait and she cries. It's the worst feeling in the world watching my little girl hover over me sobbing saying "hold me hold me." I make sure to pay Val PLENTY of attention when Veronica is sleeping. (In fact, I feel guilty that Veronica spends so much time on her back in the Pack N Play. SHE isn't getting as much attention.) Every day I take Val outside to play. We've been drawing with chalk on the cement. Riding her tricycle. I've been pushing her up and down the driveway in the stroller. I try to involve Valerie in everything by asking her to help. Which she loves for a few minutes, but quickly loses interest. I even got out a baby doll and a bottle for it and told Val she could feed her baby when I feed Veronica. Didn't work - Val wants me to hold the doll! It's really wearing me out. I'm constantly being pulled in different directions. It's tough trying to divide my time, and yet still find time for myself. 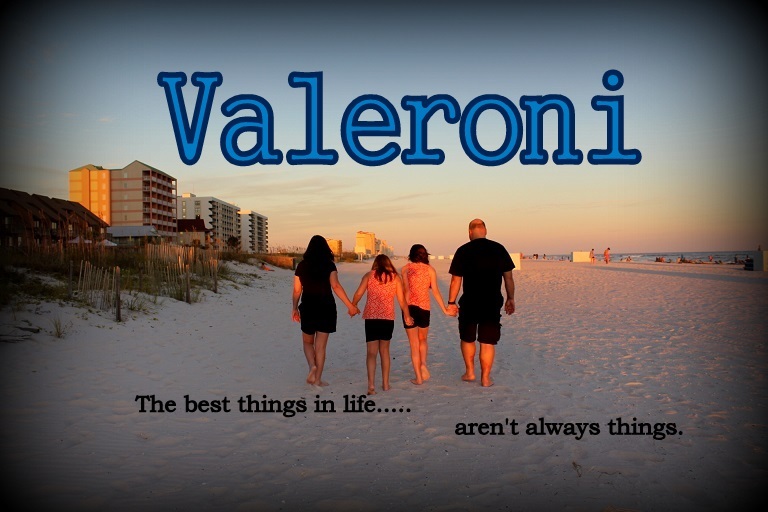 It's hard to go anywhere fun because Val will want me right along side of her, and how can I do that with Veronica? I was given a baby sling which would be a great solution ... BUT it's very heavy fabric. Bulky with a long tail, and not comfortable at all. Plus, it's already 80 degrees out, and the thought of having that heavy fabric and a 12 lb baby pressed against me is not apealing!!! So, that's not really a good option for me. I hope this needy phase of Valerie's passes soon. Other moms make it look so easy. So, what's wrong with me?? I'm just frustrated... and exhausted. Sunday I'm taking a Vacation Day! Yippee!! I get a day off!! I think I might go see a movie. Veronica slept SEVEN straight hours last night! YAY! Hopefully she'll start doing that on a more regular basis. Valerie... Eh... she was up at 4:30am!!! Wide awake yelling 'lay down Tigger chair!" Then "living room living room!" Yes, she wanted to GET UP! So we put her in our bed, and she started playing with a few stuffed toys. "Lamb, go to sleep Lamb!" "Lamb, watch TV Lamb!" "Lamb, change diaper!" It was funny... almost. We popped in a Dora DVD. Finally, close to 6am or so, she drifted off. For the first time today, I ventured to Wal-Mart with both girls by myself! Valerie loves to shop, and Veronica slept almost the whole time. It felt really good to get out of the house. Kinda sad that the highlight of my week is going to Wallyworld. Seems like all I do is sit at home and mess with the kids and housework all day long. No visitors... no place to go... We're just here, by ourselves, all the time. It's depressing. Clint is having shoulder surgery on June 7th and will be in a sling for quite some time afterwards. Send good vibes our way that everything goes well! I seriously need to do something about all this extra weight. I weigh the same that I did two weeks after Veronica was born! I haven't lost anything since. I know I haven't been exercising like I should. I have been eating fairly decent, considering how bad I ate when I was PG. We need to go join the gym or the Y. I just feel so gross. Like the sterotypical frumpy housewife. American Idol is RIGGED I say. Has to be... Jordan and Blake in the finals?? Melinda goes home??? Melinda is in a different league than those two. I admit Jordan is good. Blake's main tallent is beatboxing.... C'mon!!!!! It happens every year... the favorite... the best... gets sent home. Beat box boy better NOT win. Happy Mother's Day to Moms everywhere! I hope it was a special day for all. The florist delivered flowers for me Friday from Clint. For my gift, he gave me this awesome back massager (much needed!) and a new hard drive for my computer. (My 40 gig hard drive is completely FULL of pictures!!) We spent most of the day at my mom's house. My mom made dinner reservations for 4 adults and a 2 yr old in a high chair (she didn't mention Veronica since she wasn't eating!) for us at the Holiday Inn by her house. The food is really good and for every holiday they offer a huge buffet. Well, for some reason they stuck us in this tiny booth. Tiny - like a McDonald's size booth. My mom had requested a table and there was no way all of us would fit in that booth. We complained a bit and was told there was no other available tables. So, we decided to just take over the empty booth behind us and take up two tables! Then, there were NO high chairs or booster seats available! How dumb is that?! Luckily Valerie is old enough to just sit, but I'd rather her be in a high chair so she can't run around. But... What's the point of a reservation if you don't get what you request?!? Anyway, after all the aggravation we managed to have a nice dinner. We came home, let Valerie play outside in the sprinkler, and pretty much did nothing around the house. Much to our surprise, someone in our neighborhood offered us this big plastic play thing for Valerie. She has a small slide, and they happened to see her playing on it. Then offered us the slide/house they had since their kids have outgrown it. It just needs to be cleaned - not a thing wrong with it. Of course we didn't say no! I didn't tell Val anything about it and waited until she noticed something in the yard. "what dat, momma! what dat!?" and of course insisted that we go outside. She had the most fantastic time playing on it! It was so cute. It was such a nice day I even let her eat lunch on the bistro table. Right in the middle of the growth chart (50th percentile.) She's doing great! She was all smiles when we got to the doctor. Until her three shots that is.... poor baby. She handled them well though. She was a bit fussy and needy yesterday, but today she seems fine. I had a thyroid check up yesterday also. Routine stuff... nothing special. After I went to Old Navy to see what they had. Man, they have racks of little girl clothes dirt cheap! I found two pairs of jeans for me marked down to $4, but I put them back when I found the kid stuff. I probably have 30 pairs of pants in my closet already anyway, and I SWEAR at some point they will fit again!!! I ended up spending $50 on Valerie clothes for next winter. I got 15 pieces - mostly shirts, but I did get a jogging suit, 1 pair of jeans, 1 pair of pink cargo pants, and a jacket too. I got 5T, which seems awfully big... but right now she's wearing 3T and 4T shirts. So, it should all fit at some point next year. Y'all know me, can't pass up a bargin! I want to go back and check for Veronica .... it'd be neat if they had a few matching shirts to wear. Happy two months to Veronica! Hard to believe it's been two months already... She's finally started smiling - really smiling - at us. And I swear she's trying to roll over already! I take her in Tuesday for her well baby check up. Today was Valerie's first official Disney experience. I took her to see Disney on Ice: Princess Wishes. We had rink side seats and a perfect view of the ice. I've always loved to watch ice skating, so the show was a treat for me too! The skating was pretty good. Valerie, eh... she was scared at first. She sat on my lap and made me put my arms around her. It was dark, loud, and at some parts she was trembling. (The Sleeping Beauty dragon was scary and some kids around us burst into tears when the dragon spit fire that lit on the ice.) In the middle she was pointing and smiling. Towards the end I think she was just ready for it to be over. She enjoyed it over all though. When we got home, she told Clint "daddy, Mickey Mouse... fun!" I do have to complain about the prices though. As if $85 for TWO tickets wasn't enough... the merchandise was ridiculous. $10 for a bag of cotton candy and a rubber Flounder hat, c'mon! $18.00 for a light spinner. I didn't buy anything. Luckily Valerie hasn't caught on to asking for things yet!!! I got the best news today... MADE MY DAY!!! Finally, he got what he deserved. Aren't I horrid? *evil laugh* Believe me, he finally got what was coming. He's the biggest Idiot without a clue. We're back! And although it's nice to get away, it's nice to be back home. We had a great trip, over all. Friday ~ Zoo day! We got to the zoo about 10:30am, and there must have been 1000 busses of school kids there. Field trips I guess... it wasn't bad though and most of the groups were gone by noon. We had great weather - cloudy and cool! Valerie LOVED the zoo! She had one meltdown over a carousel ride, but it wasn't too bad. We had dinner at the Saltgrass Steakhouse with a couple of friends. Yum! Saturday ~ Halliburton Fun Day. We got to the Buckhorn Ranch at 11am just as things were getting started. I'm glad we got there so early because Valerie was able to enjoy some of the events before lines formed. She and Clint rode the train, she jumped in the bounce house, played in the playground... It was nice I guess, but it was SO hot. And the grounds are all hills and grass, not exactly ideal to push two strollers around! The food was eh, so so. It was crappy that we each got ONE ticket for ONE serving. There was no going back for seconds. Clint and I both said we wouldn't be going to it again. The Louisiana Fun Days are much better! That night we had dinner at Lupe Tortillas. Yum Yum! Sunday ~ We visited The Woodlands Mall. Definitely one of the biggest malls I have ever been too. We didn't buy a thing though! We let Valerie play in the kids area for a while. Then we walked around a bit. Lunch was at The Cheesecake Factory. Sooo good! Poor Valerie though. She was exhausted and whined and cried while we were there. She was so tired that after she ate a few french fries, she rested her head on Clint and slept for 30 minutes. Anyone who knows her knows that 1) she normally will not sleep just anywhere. and 2) she will not sleep with out her "Nigh Nigh" (pacifer) or her "Fred" (rabbit.) She was so worn out! Val woke up crying (of course) so we calmed her down by taking her on a boat ride. There is a lake outside of the mall with a water taxi. Pretty neat. We walked around the mall a bit more and went back to the room. Monday ~ we drove home! And made it back with in 6 hours with only a few needed stops!